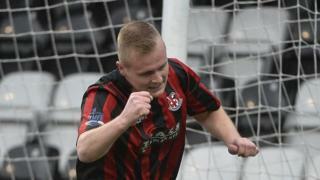 Striker Jordan Owens scores twice as Crusaders beat Warrenpoint Town 3-0 at Seaview. Owens headed the opener and Diarmuid O'Carroll bundled in the second with Owens shooting in to wrap up the victory. Crusaders are second in the Premiership table, two points behind Cliftonville, while Warrenpoint remain bottom.